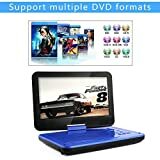 A portable DVD player is the perfect thing for keeping the kids busy on extended car journeys. Whereas older models typically relied on pure battery power, more modern alternatives even boast in-car chargers and AC adapters that are often compatible with newer vehicles. 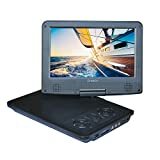 Below, we’ve put together a list of 5 of the best portable DVD players that you can currently buy for your long family journeys. 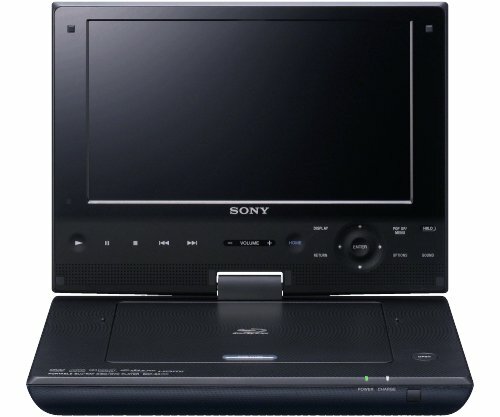 Despite being available on the market since around 2012, the Sony BDPSX910 still enjoys an enviable reputation as one of the most well-received portable DVD players you can buy. It also supports the newer Blu-ray disc format, extending the range of media available. This Sony DVD player has a fixed, built-in battery with a 4.5-hour lifespan, powering a 9-inch high-res., widescreen LCD. Though there is no AV input, there's a USB port for media such as movies, music, and pictures. Charging in-car is possible, and there's an AC adapter and remote control. As a Sony product, this DVD player comes with the same quality you’d expect from any Sony-brand television, for example. The audio-quality is also excellent in several regards; the speaker plays clear audio without the need for headphones, whilst the unit has a wide range of volume control and does not have to be on the highest setting to be heard well. The battery can’t be disconnected from the base unit, meaning that when the DVD player is stored, the charge will continue to deplete. Also, controls beneath the screen are not backlit, so, they’re difficult to spot in the dark. Lastly, you’ll need to tune the picture to your preference, but none of these are major drawbacks. 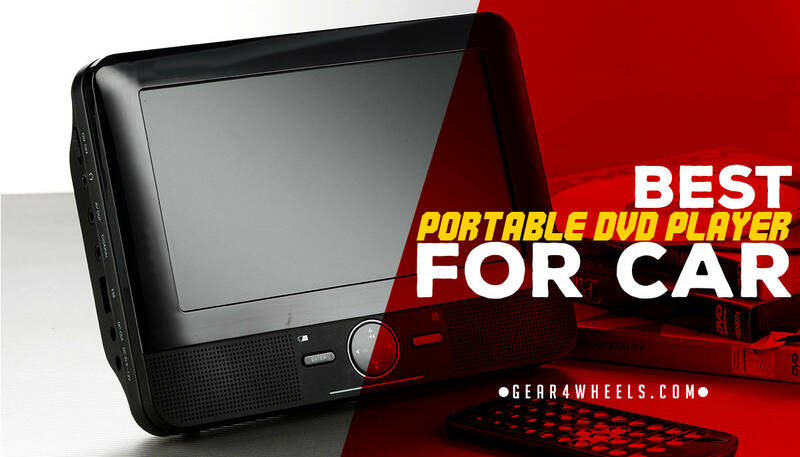 The Sylvania portable DVD player is ideal for the person who doesn’t want to spend a great deal of money on a brand name. That said, the quality offers less in the way of reliability and may fail more quickly than more expensive rivals. Available since 2013, it has mostly positive feedback. 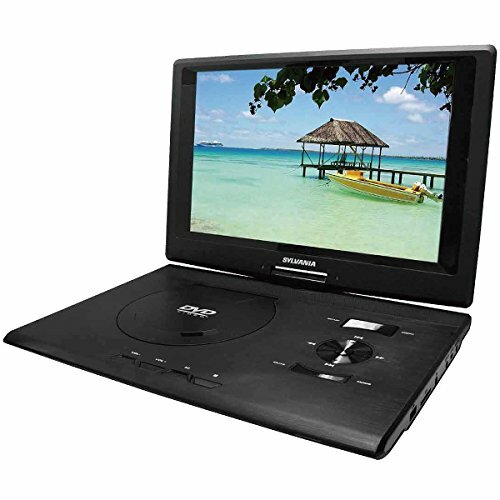 This DVD player model offers one of the larger screens available, at a total of 13.3 inches. The screen also swivels to 180-degrees for convenient viewing in a range of scenarios. There are built-in USB and SD card readers for additional media, as well as a rechargeable battery, and AC and car adapters. The inexpensive materials used are good for one thing; the model is very lightweight and easy to carry around inside the luggage. It also means that the product overall is cheaper than the brand-leaders, such as Sony. Finally, the screen is 11 inches by 7 inches, which is on the larger end of the spectrum. 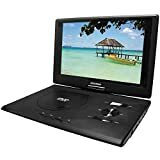 As one of the more inexpensive options, this DVD player is built from flimsy plastic; this results in a product with worse durability than the brand leaders. It also has a lid that can be tricky to pop open. When left in storage, this battery also tends to deplete quickly, so a charger will be required when left not in use for sometime. 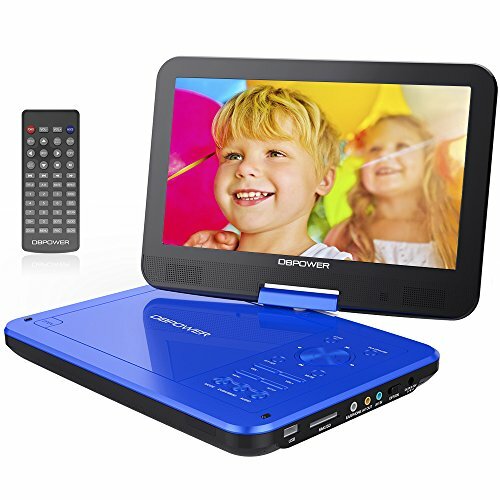 The DBPOWER 10.5-inch DVD player is a relatively small screen with a splash of color on the base. Available since just late 2016, it is the second least expensive model on our list but has a range of features. The 2,500 mAh rechargeable lithium battery inside of this model keeps it going for a long time, offering high-quality video and audio across CD, DVD, USB and more. 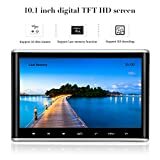 The screen swivels and rotates for a wide range of viewing angles, and there's a 'begin where you left off' feature for resuming half-done viewing sessions. With an optional splash of color available on the bottom panel, and a fully rounded design on the base and screen, this is one attractive DVD player. The screen is also designed well, with a full 270° range of motion for easy viewing. What’s more, the model supports a massive range of media, including CD, DVD, USB, and SD cards. Despite promising a wide range of support for various media types, mp4 files won’t play on this device, when loaded via USB or SD. The rest of the drawbacks center around the remote control; it’s not only miniature sized, but also features almost too many functions for its small stature. This can make it tricky to use when looking for a simple Play / Pause button. 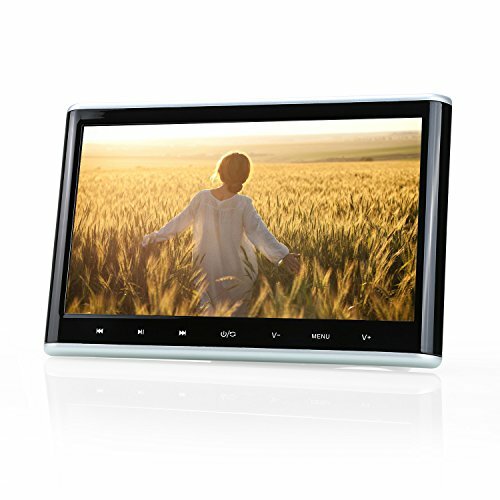 The NAVISKAUTO 10.1-inch DVD player is a tablet-style player that does away with a clunky base or flip-lid design. This is because it's designed to be used as a headrest-mounted media player. Around since late 2015, it’s enjoyed a relatively positive reception, with some flaws. This player features a 16:9 wide view angle that won't block people seated in the other end of the cabin from seeing the picture. It's DVD region-free and supports USB 2.0, as well as SD/MMC cards and USB media. Unlike some more expensive competitors, it even has a built-in HDMI port. This is the only model on our list that is completely hands-free, which wins it some points in our book. This means it can entertain even the youngest of children who might find it difficult to hold a DVD player at length on a journey. The video quality is also surprisingly good for a cheap player, with a wide viewing angle for the whole rear cabin. Loading DVDs into the player is quite cumbersome and requires the player to be moved away from its secure mount against the headrest. Handling aside, installation is also a pain. The user manuals are incredibly basic and don’t help to reduce the lengthy installation time that can be made more difficult by the lack of a battery and needing to connect power cables. 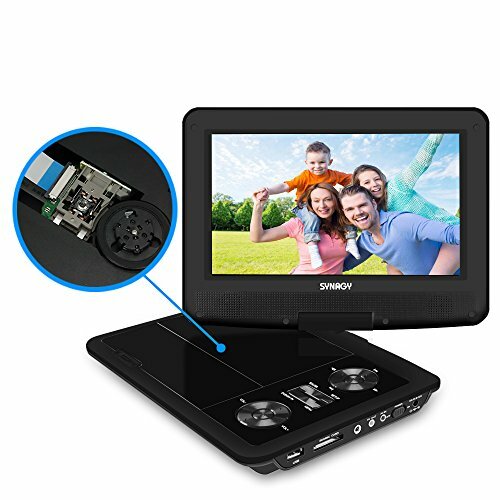 The SYNAGY brand has been producing portable in-car DVD players since around 2015, and the A29 model is one of the cheapest products available within their range. What you save in cost, you make up for in reduced quality, but as a quick-win to make those car journeys with the kids easier, it won’t break the bank. The screen features a 260° swivel screen that can rotate at a 90° angle left or right, and flip 180° to be horizontal. There's a Last Memory Function that allows instant resume of half-finished movies, and a wide range of media is supported. Despite the cheap build quality, the player is sleek and stylish, with an attractive-looking control panel built into the base. The whole DVD player screen can flip horizontally for use in the same way that you would hold a tablet, and what’s more, it’s only a fifth of the price of the brand-leading Sony model we’ve reviewed above. The screen on this model is quite small, whereas many models will opt for at least 10 inches, this one comes in at just 9. Volume control is also an issue through the built-in speakers, which makes it difficult to hear unless sat very close. Due to the build quality and reputation afforded by the brand, our pick of the above 5 players is the Sony BDPSX910 Sony Portable Blu-ray Player.Though it’s initially more expensive, this at least provides peace of mind as to the durability and reliability of the product. Though it lacks some quality of life features, such as backlit controls, there are no glaring problems that would prevent us from scoring this product 5 stars. The owner of this website,gear4wheels.com, is a participant in the Amazon Services LLC Associates Program, an affiliate advertising program designed to provide a means for sites to earn advertising fees by advertising and linking gear4wheels.com to Amazon properties including, but not limited to, amazon.com, endless.com, myhabit.com, smallparts.com, or amazonwireless.com.